A brain tumour is a form of cancer affecting the covering of the brain tissue or the brain itself. How can I tell if my dog or cat has a brain tumour? A pet will develop symptoms that relate to the location of the tumour and the function of the brain in that region. The most common sign is epileptic seizures, particularly when seizures occur in a dog over seven years of age. Other signs include behavioural changes such as vacancy, frequent disorientation and loss of normal training; wobbliness, weakness and blindness. All of these signs can be associated with a number of other conditions. What is the cause of a brain tumour? Brain tumours are normally the result of age and time and the unfortunate necessity for cells to divide. We also recognise that certain dogs breeds may be more likely to develop brain tumours such as Boxer dogs and Golden Retrievers. We do not recognise any lifestyle or dietary influences on brain tumours. 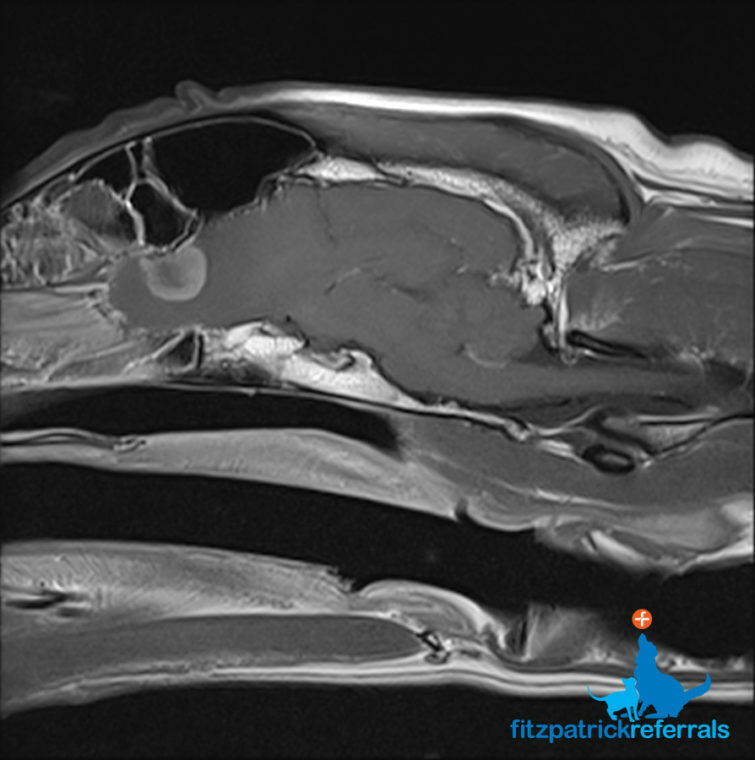 An MRI scan is needed for a radiologic diagnosis. 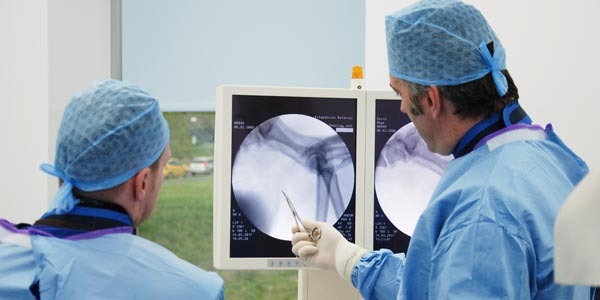 A complete diagnosis requires a piece of the tumour to be looked at under a microscope. 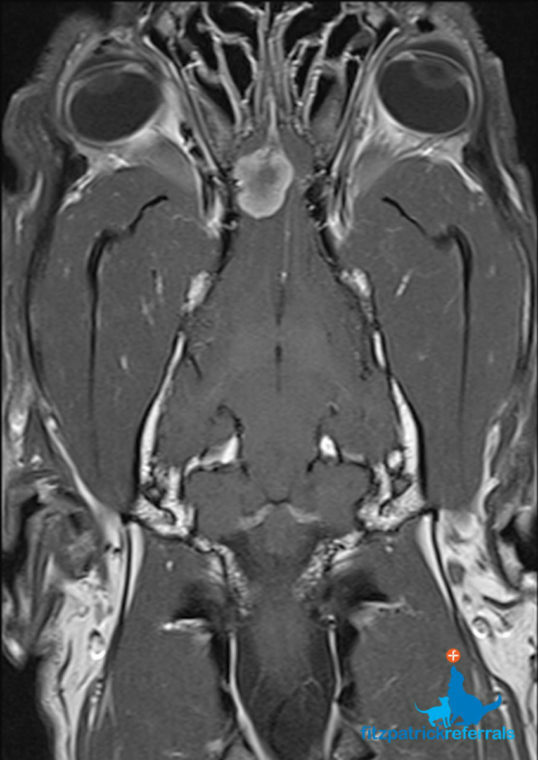 A good physical neurologic examination can be very helpful where this is not possible, as pets with brain tumours often have slowly progressive neurologic abnormalities that are asymmetric (i.e. affecting one side of their bodies). Brain tumours can originate from the outer lining (the meninges) of the brain, the inner lining, the blood vessels of the brain, the glands inside and beneath the brain, or the deep tissue of the brain itself. 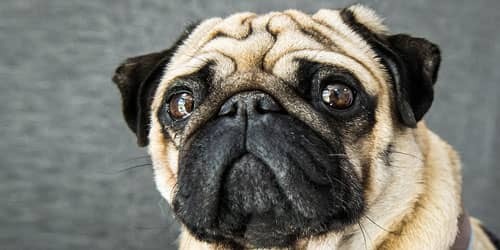 The most common brain tumour in dogs and cats is called a ‘meningioma’, which is a typically benign tumour of the meninges, although malignant variants exist. Tumours of the deeper brain tissue are also common, which we group together and term ‘glioma’. 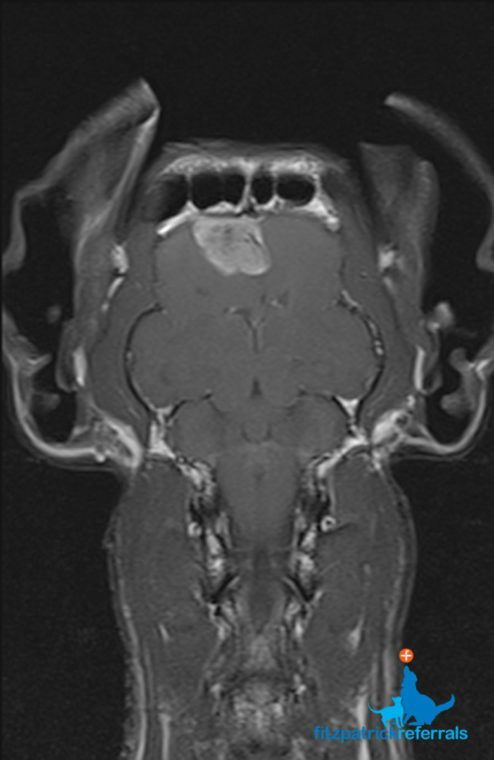 Glioma is typically malignant. Other rarer brain tumours include choroid plexus tumours, ependymal tumours, pituitary tumours and embryologic tumours. We also see white blood cell cancers such as lymphoma and histiocytic sarcoma in the brain. 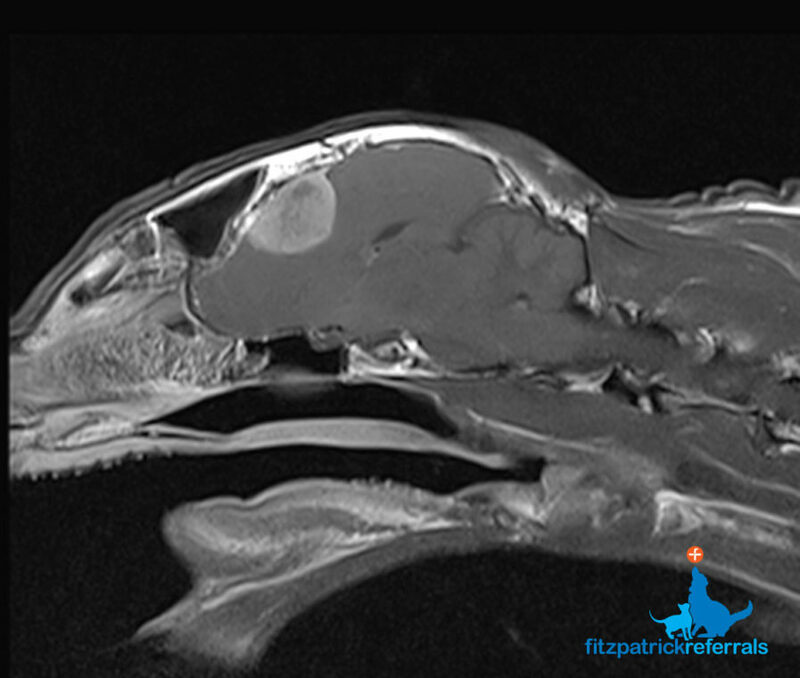 In veterinary medicine, it is important to remember that brain tumour biopsy is considered a difficult and risky procedure and so treatment options are often based on the MRI appearance of the brain tumour. 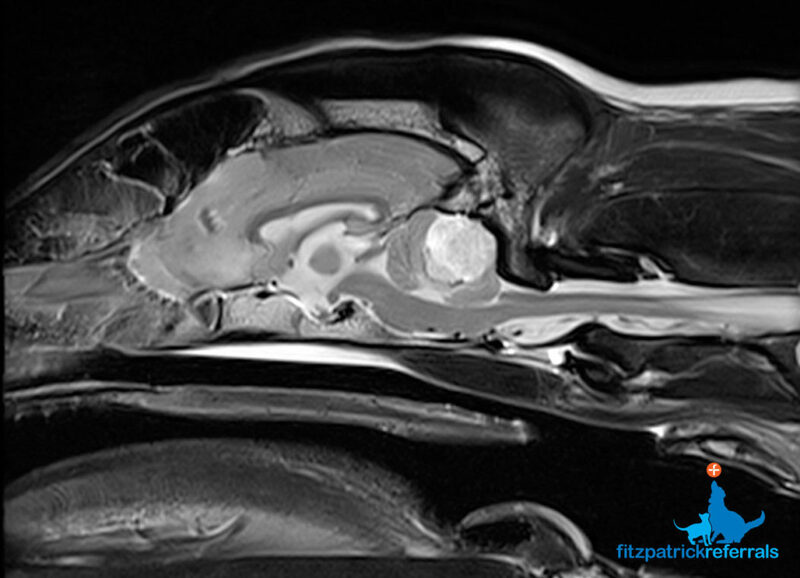 A series of MRI scan images of a canine brain tumour. Like all cancers, brain tumours can be definitively treated with chemotherapy, radiotherapy and surgery. Which of these treatments, if any, are appropriate, is dependent entirely on the type of brain tumour. Some tumours are very responsive to medication, such as white blood cell cancers. Most tumours will cause local blood vessels to ‘leak’ and the build up of fluid can cause problems; medications such as corticosteroids are very useful in relieving this fluid. 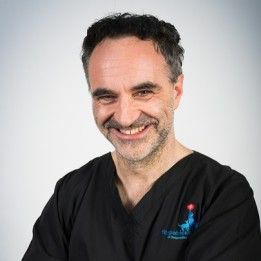 Surgery is possible in some instances, particularly when the tumour grows on or near the surface of the brain where it is readily accessible with minimal trauma to the rest of the brain. 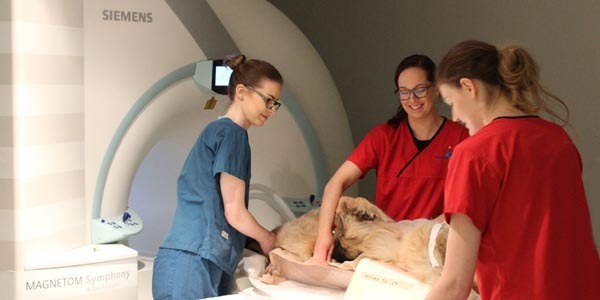 We do not typically operate on deeper brain tumours in dogs and cats as the negative aspects of brain surgery potentially outweigh the long-term benefits to the patient. Radiotherapy may be as effective as surgery in some types of brain tumour. Radiotherapy is particularly useful for tumours that cannot be accessed easily with surgery, or tumours that are quite large. Pituitary gland tumours of a certain size are a good example of this. What is the prognosis of brain tumours? The prognosis is dependent on the type and location of brain tumours. 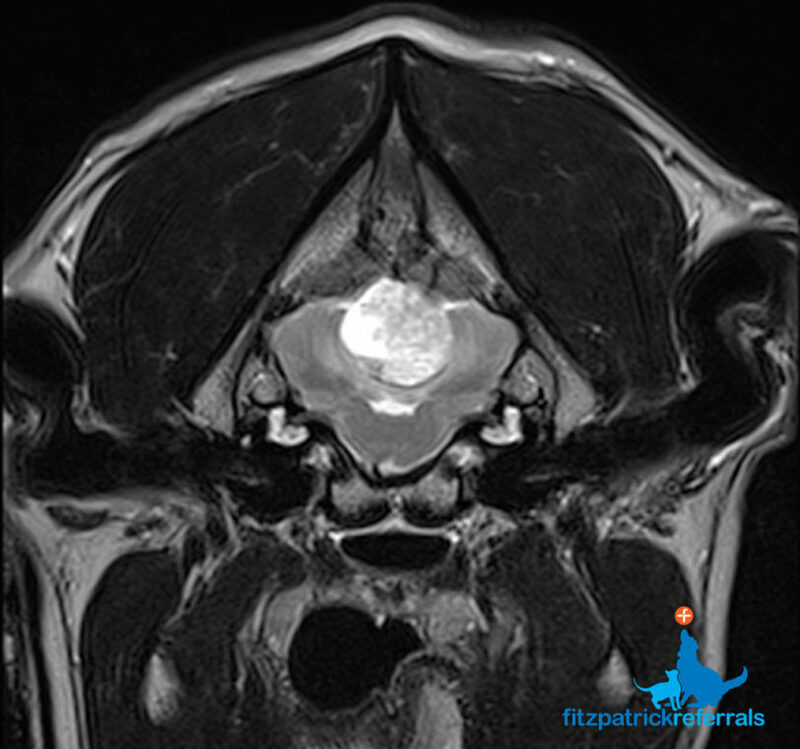 Unfortunately, the overall prognosis for brain tumours in dogs and cats is poor. However, there are several good examples where one of the treatment options (medication, surgical and radiotherapy treatments) can result in a cure of the tumour, or at least a very prolonged remission period. 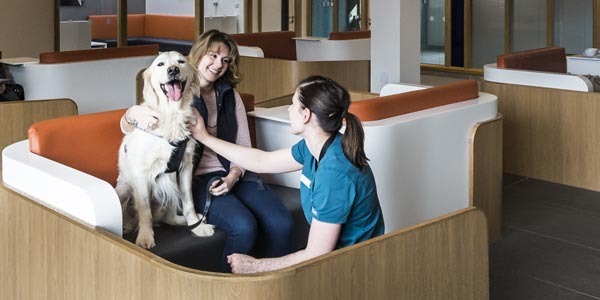 We would recommend that the advice of a veterinary neurology specialist is sought for a thorough discussion of the options available in each case and the ethical implications each treatment option may have.